If you love the outdoors and being in nature, then the Back Country Safari snorkeling and kayaking combo tour is the tour for you! Departing from Old Town Key West daily, the Back Country Safari is one of the best ways to immerse yourself in the natural beauty of the Florida Keys through an all-day excursion that features sailing on the calm waters of the Gulf, snorkeling at the coral reef, and kayaking through the Mangrove Islands. If the weather permits, we even have an amazing island beach stop that we try to go to during the journey. 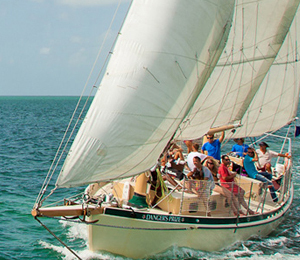 This is the best way to take in all the natural beauty of the Florida Keys! We head out every morning on one of our specially designed shallow-draft sailboats that provide stability and comfort while being designed to access certain areas that many of Key West’s larger boats are not able to access. The adventure starts off at one of the best stops for shallow water snorkeling, where you will get to swim above the extensive and diverse coral reef ecosystem of Key West. This underwater ecosystem provides a home for thousands of creatures, and when we go snorkeling here, we do so with care and delicacy, making sure to not disturb the fragile ecosystem. While snorkeling, you will get to see all kinds of marine creatures ranging from reef fish to reef shark to lobster and sometimes even a sea turtle or too! After snorkeling, you will get the chance to jump on our sturdy sea kayaks that you will use to explore the Mangrove Islands. The Mangrove Islands are a vast collection of mangroves that, much like the coral reef below the water, offer a home to all kinds of species. Here you will see the land and air species that make their home in the Florida Keys. Exploring the Mangrove Islands is best done on a kayak, and we are confident that even those with no experience kayaking, will have a great time on this tour! Our crew will provide you with instruction and pointers on how to maneuver your kayak. The Back Country Safari also offers guests a full picnic-style lunch and drinks. Space is very limited on this tour so we highly encourage reservations be made well in advance! What is included with lunch? Lunch includes curried chicken, tuna, and pasta salads. A selection of deli meats, cheeses, artisan breads, and a little something sweet! How many passengers can this boat hold? I have been to the Bahamas many times, but Back Country Safari is one of my favorite trips! It includes everything that everyone should do here. As a Bahamas veteran, I can say only the best about this experience!